A tour that encapsulates the best of Himalayan experiences in a span of 7 days, designed exclusively for City dwellers with short holidays. From foothills to high mountains, from pine forests to cold desert – this tour takes you through the heart of Kinnaur district before continuing to the highlands of Spiti Valley. Along the journey you will witness – high passes, dangerous roads, deep gorges, snow mountains, pine forests, vast riverbeds, high altitude villages and the most amazing people. We pick you up bus stand at Shimla and so our trip begins. The drive takes you over the hills of the Shimla district through the towns of Kufri and Narkanda. After the initial dash over the hills, the road descends down to the Sutlej valley as we continue to the town of Rampur on the southern bank. The roads are carved on vertical rock faces at several locations giving itself a distinct identity. This road is popularly known as Indo-Tibet Highway. You’ll be welcomed by several hydroelectric power projects as you enter Kinnaur district, the major one at Karcham where a dam is built at the confluence of Baspa and Sutlej rivers. From Karcham we cross over the bridge and enter Baspa Valley to head towards Sangla for overnight stay. Today we take the road to Kaza till we reach Sichling village, from here the road winds up to the Dhangkar monastery, which was once the capital of Spiti, under King’s rule. Dhang means cliff and kar means fort, the fort situated on the edge of a cliff. Dhangkar Gompa or monastery is one of the architectural master pieces of the Buddhist yore. Built 800 years ago this is one of the endangered archaeological sites in the world. Experience the old world feeling of the Dhangkar monastery. An hour and half hike takes you the beautiful Dhankar lake, relax and click as many photos on the shores of this beautiful lake before heading back to the village. From Dhangkar we drive towards one of the little know villages of Spiti, Lhalung. With Snow capped peaks in the background and the cultivation fields built on the slope of the mountain Lhalung is a photographer’s charm. Golden Temple or the Serkhong Gompa is another 1020 year old monastery adorning this little village. Drive to Pin Valley – a tributary of the Spiti river, ‘Pin’ originates deep in the Trans Himalayan mountains leading to one of the ancient trade routes and popular trek of Bhaba Pass. It is also home to the magnificent Snow Leopard and several Trans Himalayan animals and rare birds protected under the National Parks of India. You’ll drive through this beautiful valley up to last village of Mudh. 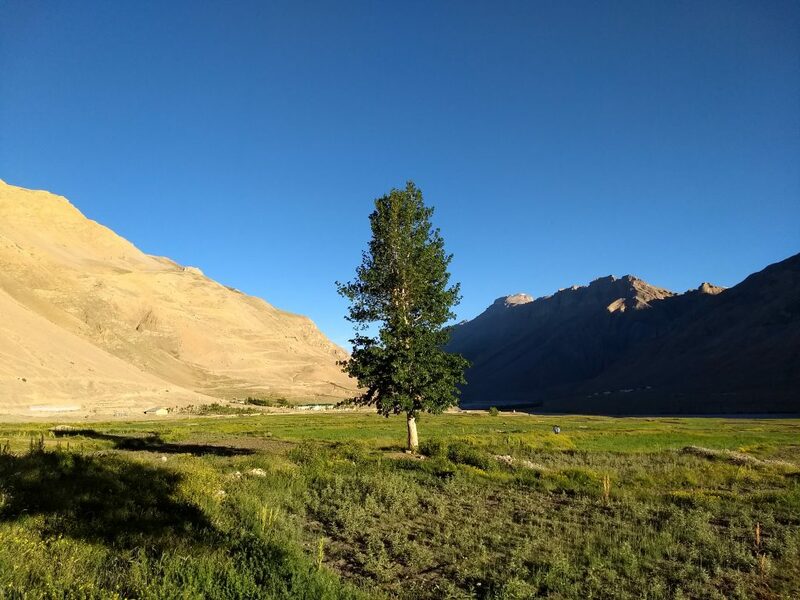 After trying some local homemade pizzas for lunch, you will retrace the roads back to Spiti and continue to Kaza – the administrative headquarters of Spiti. Explore the local market in Kaza and go for an evening walk amidst the fields of Kaza.